Ladies Bust Display Form black & white pattern linen strip fabric, this medium sized upper torso form is perfect for any blouse and can make any designer top look great. Goes great anywhere inside a store. 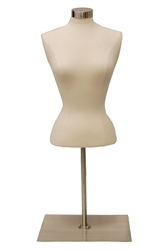 This female bust form can be adjusted in height from 52.4" to 66.1". This range of setting options enable the display to be adapted to suit your specific need. This display bust ships complete with the torso, the tripod stand, the thistle top, and pole.